Many children with motor planning and social challenges find gym class, recess, staying physically active, and even simple recess or social games extremely frustrating. Not feeling successful in physical play with peers can lead to poor self esteem. To help, the Autism Society—Omaha Support Network has developed Recreation Club. Kids in need of more movement assistance and/or social coaching come together every week to work on gym activities, physical fitness exercises, and even social games played on their own school playgrounds. This interactive, activity-based program will emphasize improving physical competence while developing social skills to improve peer interactions. Activities have been designed to improve body awareness, strength and motor skills. Kids will also learn sportsmanship, teamwork and problem-solving skills during gameplay. Our goal is to improve ability and confidence for school, encourage continued physical fitness into their later teen and adult years, help them learn to social skills to interact with their peers in recreational activities in their daily lives. In order to maximize the experience for all participants, all registrants will be required to bring along a “Buddy” – who will NEED to remain on the premises at all times. This Buddy can be a parent or sibling over 16 years of age. We understand that not all athletes will want to work with their Buddy and we will help facilitate a Buddy Swap if desired. However, in order to achieve our goals for all of our participants it is important that we are able to provide consistent one to one support for every participant. This is also a great way for the family to grow together in your recreational endeavors! Target Audience: Youth who are fairly independent but miss out on the subtle instruction in a large setting. 1:1 intensive support cannot be provided. Full payment is required to secure your spot. We are not able to prorate for sessions missed. Download the registration paperwork HERE. Summer Rec Club is open! Visit our eventbrite link to reserve your spot! I have been working for ASN for almost six years now and am one of the original Rec Club coaches from when the program was first developed. I have been a personal trainer for 8 years for my full-time job. I also coach high school basketball, I mentor kids with Type 1 Diabetes (I live with T1D) and I volunteer to raise money for the JDRF and ASN. I am currently enrolled at Peru State to become a Special Ed Teacher and I should be done with school in about two years! Working with the kids in Rec Club is what drove me to go back to school and work with as many of these kids as I can on a full-time basis. My favorite part about Rec Club is the connections with the kids and watching them learn and grow every single time I see them. Nothing beats the smile on the face of a kid who just accomplished something new! Hi! My name is Jennifer Barenberg and I am one of the ASN Rec Club coaches. 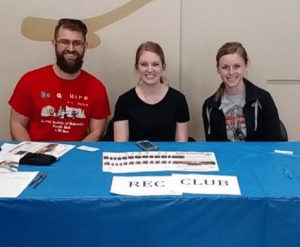 I began volunteering with Rec Club as a part of UNO NSSLHA four years ago and have been a Rec Club coach for the past three years. I graduated with my Master’s degree in Speech-Language Pathology in 2016 from UNO and I am currently a full-time speech-language pathologist for Elkhorn Public Schools. My goal for Rec Club is to teach and allow social situations between the participants and volunteers. At Rec Club we encourage our participants not only to engage in physical activities, but to also use social skills that have been previously taught during those activities. I look forward to seeing you at our next Rec Club class! My name is Becci Brock and I am from Norfolk, NE. I moved to Omaha where I attended the University of Nebraska Omaha and I received my undergraduate degree in K-6 Elementary Education and K-9 Special Education. I have now been teaching high school special education for 9 years for Millard Public Schools and help coordinate an Autism Rec Club for the Autism Society of Nebraska – Omaha. I have also earned my Master’s degree in Autism and Severe Profound Disabilities from the University of Nebraska Lincoln.